Can we ever really be defined by more than just our politically driven socio economic failures? The answer to this single question is complex and at the same time obviously simple and clear. We are diverse, colourful, industrious, resilient and hopeful. Our adaptability and resilience is based on a strong sense of identity and is our not-so-secret weapon in addressing how we approach an uncertain future. Let us combine our strengths, in peaceful but subversive ways, to ensure that our culture and our identity remain intact. The ties that bind us are the shelter we need to remain strong because we do not know how long this storm will last. The sheer scale of infrastructure and skill investment ,over and above political will, that are needed to restore our industries to their former glory is demoralising, but we must find a way to see hope in our condition. It is easy to dismiss, but we must discuss how we can reinvigorate and take back control of our local economies without crying out to the state to make amends. Can we bypass the need for heavy foreign capital investment and use our local knowledge and environment to bring Zimbabwe back under the control of Zimbabweans? Can we use the predictions of changes to global economic powers to drive how we can rebuild without regressing to the heavily polluting industries of the last century? All hope is not lost, part of our journey must involve addressing not just the how, what, and who of the past but the how of the future. It is not an easy task but we have a great wealth of knowledge and experience across the home and diaspora populations. Let us take the entrepreneurial spirit and hard graft that have sustained us, organise it and make it our national export. We have done it before, let us do it again. We are so focussed on the established models of wealth generation and yet every day, Zimbabweans show how a motivated community can survive with near 90% unemployment generating income in the informal sector. Hope lies in the fact that we are still here and even though we are suffering we are still surviving. We have the resources to help each other even if we may not have much money. The idea that cooperatives, buying clubs, community projects, and charity are the preserve of NGOs servicing only the rural communities is one that prevents us from helping ourselves. We need to form groups and start talking, sharing and working together. In town and country, let’s form cooperatives, strengthen our networks, and build knowledge transfer communities. We have festivals of arts and culture, thriving music communities, social clubs, and online communities. If you are not already involved, join these forces for good or start one yourself. Just as everything that glitters isn’t gold, not everything that is bought, imported or expensive is best, good or better than what we can do and make as Zimbabweans. Statutes and by-laws do not define us, instead our participation in the traditions we make and inherit are a defining force of our culture. Every conversation we engage in involves the definitions and opinions of politics and how they affect our lives. We have come to be defined by the political incentive for our migrations, for our economic woes, and for our party political support. If it is at all possible, let us remove politics from the equation for the briefest moment and again consider what it means to be an everyday and lifelong Zimbabwean. Let us start the conversation here; on paper, online, and in safe places and friendly company – wherever you can find a willing participant. 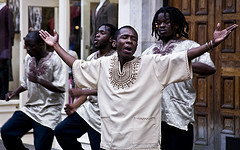 What is Zimbabwean culture and how can it help build a better present and future? How does your personal and professional behaviour build a better Zimbabwe?